Chief Spokesperson for the European Commission Margaritis Schinas highlighted that the European Union will be following closely the case over WikiLeaks founder Julian Assange. "As a general rule, we will not improvise a position on events that are unfolding since we have taken the podium. The European Union is ready and not afraid of a no-deal Brexit, a spokesman for the European Commission said on Wednesday. Margaritis Schinas made the statement ahead of a summit of EU leaders devoted to deciding on Britain’s exit from the bloc, Reuters said. European Commission Spokesman Margaritis Schinas says the recent visit of Greek Prime Minister Alexis Tsipras to North Macedonia was part of the idea of a European normalization in the Western Balkans, where Greece maintains and should maintain a decisive role, MIA reports from Athens. The European Union’s executive said on March 28 that if Britain fails to ratify its divorce agreement this week, Brexit will only postponed until April 12 by which time London must inform the bloc of its plans. 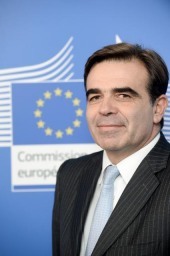 European Commission spokesman Margaritis Schinas was commenting on indicative votes in the U.